I finally got around to making these soaps that I wanted to try for Amy's (Great Cakes Soapworks) Soap Challenge. 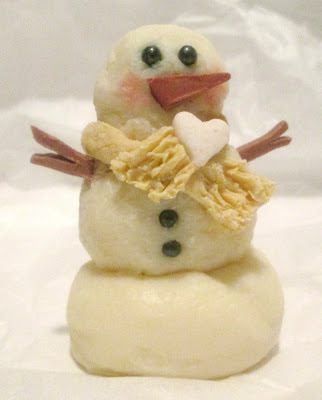 You can see her challenge post here: Combining melt and pour and cold process soaps. I’ve been wanting to try a couple of new techniques for a while now, so this challenge gave me the opportunity to try both! 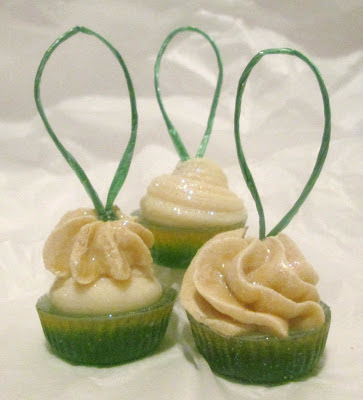 First I made the mini cupcakes, which stand only about 1.5 inches tall. The mold that I used was actually a candy cup mold (for making peanut butter cups). I melted and poured some green soap that was fragranced with Pear into the candy mold until it was half full, and then let that set up. Then I poured melted honey soap that was fragranced with Clementine Cupcake over the green layer, filling the candy cups to the top. While those were setting up, I made a small batch of cold process soap and colored a portion of it with yellow oxide and gold mica. I had never piped soap before, but I’ve been wanting to try it for a while. I used a large Ziploc bag as an icing bag; I cut the tip off one bottom corner of the bag, just big enough to insert the icing tip through. Then I tied off the bag with a twist tie, just above the tip, so that when I put the soap into the bag it wouldn’t spill out of the tip until I was ready to take the twist tie off to pipe. I put the tip side of the Ziploc bag down into a large cup and folded the extra bag over the top of the large cup, this helped hold the bag open to make it easier for me to fill. I experimented with 2 different tips and played around with different designs. While the soap was still wet, I inserted a small piece of green ribbon. Thank you Amy for the fun challenge, it was the motivation I needed to give these new things a try! 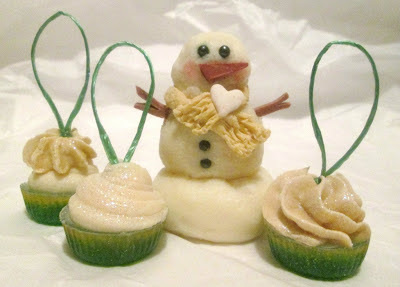 Hey Cee, cupcakes look adorable, with those ribbons make such a lovely holiday gift! And the snowman! Oh gosh,looks so real,so showy and look at that scarf...how did you make it so real and corrugated? Great time you were having while making these,Cee! These are so cute, Cee Gee! I love the mini soap cupcakes, and the snowman looks amazing! You always put so much love and effort into your projects and it shows. Bravo! The little snowman, I want him! :D He is too cute. Aw, thanks Marika! I wish I could send him to you, but my daughter already claimed him...lol! Gorgeous, Cee!I love your snowman!So cute!!! How fun!! Thank you so much for participating in the challenge! I love how it all turned out - very creative! Thank YOU for hosting the challenge, it was a lot of fun!! I really enjoyed seeing what everyone else came up with too! This is really outstanding, to the smallest detail! You really did a good job! Absolutly fantastic, great idea. I love them. What a super cute use of M&P and CP, I love it!